Cluster housing refers to a development in which homes are situated in groupings relatively close together, while larger areas of open space within the development form a buffer with adjacent land uses. Often this is accomplished through small individual lots, with the remainder of the land becoming common ground. 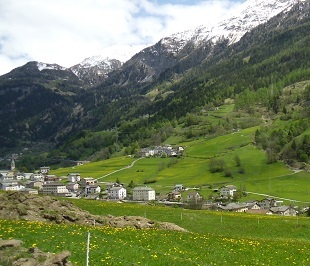 We are all somewhat familiar with this arrangement, if we think of a typical mountain village, illustrated here, or a village green forming a common grazing area for livestock. So it is not a new concept, although it may seem that way to many planning commissioners. (1) The contiguous open spaces are good practice either for conservation and wildlife habitat purposes, or for agriculture. (2) Grouping homes together reduces the initial investment in roads, streets, and utility lines, as well as the public sector's maintenance and replacement costs. (3) Relatively close proximity to neighbors means that one is more likely to get acquainted with neighbors and develop a sense of caring community. As our photo shows, this isn't some crazy new-fangled scheme dreamed up by urban planners. Mountain and lake villages, as well as many other historic small towns where people basically farmed the outskirts of town, are the prototypes for this contemporary development that often has nothing to do with agriculture. Other patterns are possible, such as a configuration resembling a rural cul de sac with homes closer together near the road, with lots becoming very wide at the rear of the lot. In places that practice land use zoning, sometimes the cluster development is able to take advantage of an existing planned unit development district. The PUD, as it is often called, allows more flexibility in lot size and placement than typical zoning districts. Despite our headline, the concept of cluster housing developments, sometimes known as conservation subdivisions, also may be adapted to suburban or even urban environments where a large undeveloped parcel has been assembled. If your community would like to save as much recreational space or conservation land as possible on your undeveloped land, consider offering an incentive for cluster housing. From an ecology standpoint, the cluster housing development is preferable to most subdivisions conceived under traditional zoning and subdivision laws. When a zoning ordinance requires a minimum lot size, minimum amount of street frontage, maximum lot coverage limits, and minimum setbacks, this encourages lots of a fairly uniform size, each with its own individual lawn. Yet when providing wildlife and bird habitat become high priorities in terms of preserving rural character or just a desirable degree of contact with nature, grassy individual lawns cannot begin to compare to native vegetation and contiguous patches of wilderness. Even in semi-rural developments, where the cluster housing idea is often perceived as most feasible, large-lot subdivisions, in which each owner manages one to ten acres independently, do not offer as much environmental benefit as a larger number of contiguous acres of habitat. In the typical cluster housing development or conservation subdivision, lots are sold individually, with a homeowners association managing the conservation land as common ground. If the purpose of the cluster housing is conservation, I also know of some instances in which the association pays a nominal fee to an interested non-profit organization to manage the conservation land. In yet other situations, some or all of the households earn at least part of their incomes from agriculture, and the purpose of the cluster subdivision is to provide neighbors and playmates for the children. Yet building and maintaining a quality road isn't as expensive as it would be if the houses were dispersed over individual farms. If all the land in a cluster housing development is included within an individual lot, the conservation subdivision concept becomes somewhat feasible if restrictive covenants are carefully written to require placement of all structures relatively near one another, and if common land management structures for the rear of these lots are incorporated into a master deed. It just seems much simpler to us to design small lots along road frontage and then larger common areas devoted to conservation and nature. • As described already, the development costs of infrastructure will be much lower for eight clustered homes on quarter-acre lots within a 40-acre development, as compared to eight homes on five-acre lots within that same 40 acres of land. While conservation subdivisions often do not quality as inexpensive or affordable housing at all, at least the semi-rural lifestyle becomes slightly less expensive. • Connected open space provides habitat for larger animals and a greater variety of animal and plant life than would be seen in the same amount of open space parceled out into individual yards. Groundwater recharge of the aquifer is more effective, because rain runs off much more slowly in woodlands, prairies, and other natural environments than from rooftops, patios, and barns. Slowing down stormwater runoff also is a form of flood prevention. • Connection to an urban sewage system may become feasible if piping distances between homes are not too great. At the very least, it may become feasible for the development to install its own "package" treatment plant, as opposed to allowing individual homeowners to install septic tanks that may or may not function properly. Of course package plants often become a maintenance headache too, but at least the community together can monitor the performance of its plant. •	Joint community facilities can be developed. Examples might be a fishing lake, a vegetable garden, a swimming pool, an implement storage shed, or a barn. •	Sometimes the motivation for keeping a large percentage of an overall development parcel in a contiguous non-developed area is recreational. Maybe you’re in a hunting-oriented community or have an unusual geological feature or spring you’d like to preserve and feature. Maybe you want trails through the woods. If your area does not have zoning, or if by state law agricultural land is exempt from zoning, you may encourage cluster housing simply by presenting workshops on the topic. Also if you have any road-building or utility ownership powers, those can be used to encourage or give incentives for cluster development as opposed to more linear patterns. In areas with zoning, sometimes the first step for a developer or an interested government would be to see that a planned development zoning classification is applied to the area or areas where cluster subdivisions would be appropriate. A developer then must submit a detailed site plan, and those details are approved as part of granting the zoning classification. In a well-drafted ordinance, criteria for approval of the PUD or PD are listed, but still there is an element of subjectivity and judgment involved in what will be approved. However, we think it's a better idea to write a separate cluster housing zoning district regulation, especially if your aim is to promote conservation and to inhibit suburban sprawl. This separate district regulation would give the town council more specific criteria related to conservation or recreation. For example, you might require that 75% of the site remain undeveloped, meaning there would not be buildings, driveways, patios, decks, or cultivated lawn areas in that preserved area. Maybe that is too restrictive; maybe 50% would be a big step forward in your environment. That area essentially will become common ground, so you will want to have standards for requiring a homeowner’s association. If you want to retain some minimum lot sizes, you may do so. Some frontage on a public road, at least enough for a driveway, would be highly desirable. Often two to four houses have a sort of shared semi-circular driveway off the main road that serves as their primary access, with only a short additional driveway back to individual garages. You can have minimum setbacks from property lines for various types of buildings also. You can have sign regulation, parking minimums or maximums, or anything else normally regulated within a zoning ordinance. The key ingredient really is that minimum percentage of the land that must be left in open space. As a governing body, you may leave that open to the applicant to propose, rather than setting that percentage in advance. In reality some areas will provide a superior quality of forest to be preserved, while others may offer only scrubby vegetation that has been ruined in part by plant species not native to your area (sometimes called "exotic" or "invasive" species). So if you require 50% of the land to be reserved for conservation purposes in all instances, your community will receive considerably more environmental benefit from the quality forest from the poor-quality hodge-podge of vegetation. You'll need to establish a minimum acreage for the entire cluster housing development. I'd think that number would be at least 10 acres, and maybe considerably higher if you're encouraging or preserving agriculture. Establish a list of permitted uses in a proposed cluster zoning district. I wouldn't leave that to chance. You may want to allow simply single-family residential and agricultural accessory uses, or multi-family or two-family might fit into your game plan as well. Occasionally a development of this type is so large that you need a tiny neighborhood commercial district, but don't permit that "as of right." For an even broader framework of green ordinances and plan review ideas, see this site on green planning. 1. If you have zoning, create a separate zoning classification for cluster development, instead of lumping them in with planned unit developments. In this way, your criteria can be more specific and objective. 2. If you wish, go ahead and map some parcels of land for this zoning classification. The advantage is that you can select the land you most wish to preserve for habitat conservation, and thereby get around the issue of only poor quality habitat being "preserved." 3. Of course, rezoning applications to allow cluster housing also should be permitted. 4. Investigate your subdivision regulations to make sure that common configurations seen in conservation subdivisions would be allowed under the subdivision regulation. Often that might not be the case, so a revision of your subdivision regulation could be required in tandem with the zoning ordinance as well. 5. Your county or village attorney will need to be involved in these discussions to make sure that nothing you are doing will preclude easy sale of the lots within a cluster development. 6. If you do not have zoning, it's still desirable to talk informally with developers, property owners who are selling, or rural families about the desirable characteristics of cluster housing. For a very detailed report on the status of cluster zoning, flexible zoning, and open space residential design in Massachusetts, see the Pioneer Institute report. This would be helpful to most of you.